A dangerous, homeless drifter who grew up picking cotton in virtual slavery. An upscale art dealer accustomed to the world of Armani and Chanel. A gutsy woman with a stubborn dream. A story so incredible no novelist would dare dream it. It begins outside a burning plantation hut in Louisiana...and an East Texas honky-tonk...and, without a doubt, inside the heart of God. It unfolds at a Hollywood hacienda...an upscale New York gallery...a downtown dumpster...a Texas ranch. Gritty with betrayal, pain, and brutality, it also shines with an unexpected, life-changing love. 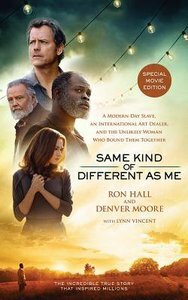 Bonus material in this special movie edition includes: a new epilogue with updates on the authors since the release of the original book; and the amazing story behind the movie, how it got made, and the incredible experiences while filming in Jackson, MS.
About "Same Kind of Different as Me (Unabridged, 7 Cds) (Movie Edition)"
Expected to ship within 4 hours from Australia.